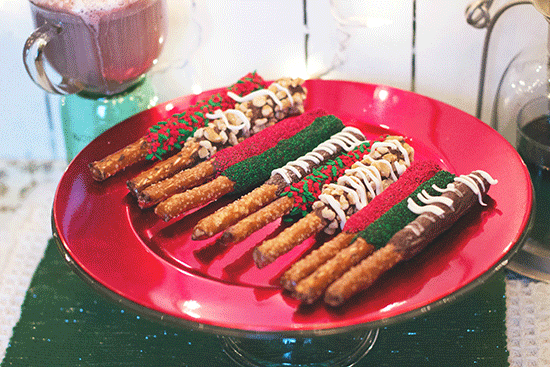 Chocolate covered pretzels are the easiest and simplest treats to share and transport to family and friends. There is NO baking, you can customize however you’d like and the options are endless. Everyone loves their salty sweet crunch; they are always a crowd pleaser, for big parties or that lucky friend. You really don’t need a recipe, you simply melt the chocolate coating, dip your pretzels, sprinkle and let dry. Melt candiquik or other chocolate coating according to the package directions. Line 1 or 2 baking sheets with parchment paper (this helps removing the pretzels later on.) dip 1 pretzel or pretzel rod into the melted chocolate coating of your choice, gently tap pretzel and shake off excess coating. Sprinkle with sprinkles, nuts. Place on wax paper to dry, approximately 30 minutes. Repeat with the remaining pretzels and store in covered container. ENJOY!